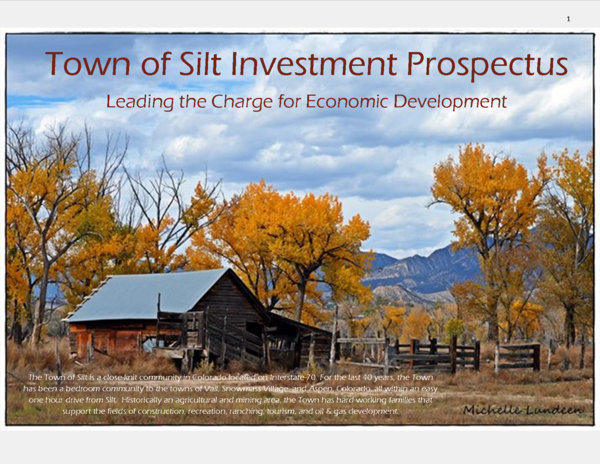 "The Town of Silt is dedicated to providing the highest quality of services to its growing population of over 3,015 citizens. Silt serves as a "Gateway to the Outdoors", offering its citizens the activities that those who live in larger cities desire. The Town of Silt Board of Trustees extends a welcoming hand to all its long term residents, newcomers and visitors. They promise to continue their work of keeping Silt an excellent place to live, a safe environment to raise children, and an area with a high quality of life." Silt's Mayor Goes to Washington! To be added, please click HERE! Info on VALE seat open for appointment HERE. Please click HERE for an application. Press release regarding Flying Eagle Park's new playground equipment! The Town is replacing the water line, sidewalk, and pavement on Pioneer Drive. Click HERE for more information. Apply for your Community Garden Plot here! Only $15 for the whole season!